It’s been said that a vagabond is a wanderer, a nomad with no home. In our case, three American vagabonds chased the train to Germany with a shared passion for one thing: beer! Having grown tired of the limited selection and homogeneous taste of domestic beer, the Vagabunds banded together to produce beers that challenge preconceived notions of what beer should look and taste like. And so, Vagabund Brauerei was born. ...when we get up early and get started grinding grains. We heat water to a certain temperature and mash in the malt. The malt is heated and is allowed time to steep, possibly a few different times at a few different temperatures. We then transfer over the tasty, sticky wort to the boiler and allow it to cook for a while. At this time we add the hops at different timed intervals. More hops can be added later to the fermentor in a process called "dry hopping", if the style (or our palate) calls for it. Fast forward weeks and weeks, allowing the yeast to do its thing, and what do we get? Beer! Our brewery is considered a nano-brewery, meaning that the system can only brew less than three barrels (352l). Ours makes about 180l. Because of that low volume, we have the freedom to experiment with all kinds of beer styles. We are currently working on expanding our production capacity, so that more people will be able to get a taste of our beer - more to come soon! Our American Pale Ale, weighs in at 5.2%. Despite being brewed with all American hops, freedom, and a pinch of “Get off my lawn” attitude, our APA is surprisingly easy to get along with. Notes of citrus, sweet malt, and an amber hue to boot, makes enjoying one or three of these a piece of cake. A mild, easy drinking beer for any time of year. Pilsner malt and classic German hops combine to make a light, refreshing take on a German classic. It’s a perennial best-seller that can be found on our taps year-round. The Bindlestiff is no mere wanderer that is gone with the wind; packed in its bindle is an IPA with white peach, grape and tropical fruit notes. The perfect beer for kicking up your feet on a sunny day when you ought to be working! Want the hoppiness of an IPA, without the need to stop after a couple? Look no further. Boasting tropical and citrus aroma, and the bitterness of grapefruit: our Session IPA is perfect for every occasion. Singin’ a sweet melody, on the ride to Amarillo. My Rifle, My Pony, and Me is a milder IPA with notes of sweet maltiness and the aroma of grapefruit, lemon, and melon. Packing a saddlebag full of Amarillo and Melon hops, this beer makes for three good companions. My Rifle, My Pony, and Me. What happened when we combined enormous amounts of Cascade, Columbus, Centennial, and Simcoe hops? Well, we got a monstrous Double IPA that is very dry, aromatic, and definitely not for the faint of heart. Brewed for the bravest of hop lovers! It’s an all star (IPA), get your game on, go drink? ...with a good beer. We wanted our beer to be consumed right where it was being brewed. Whether you're a seasoned beer connoisseur, a beer brewer, or someone who doesn't consider them self a "beer-drinker", but are interested in trying something new, it's a pleasure to sit and talk with you. ...when three American friends: David Spengler, Tom Crozier, and Matt Walthall decided to brew their own beer at home. They had grown tired of the limited selection, and homogeneous taste, of domestic beer found in Berlin stores, Spätkaufs and restaurants. They shared their creations with friends old and new in an effort to challenge preconceived notions of what beer should and could taste like. Over time, the group improved their skills and began expanding their recipes to include new and original styles of craft beer. In 2011, David, Tom, and Matt decided to take the next step and create a full fledged brewing company. 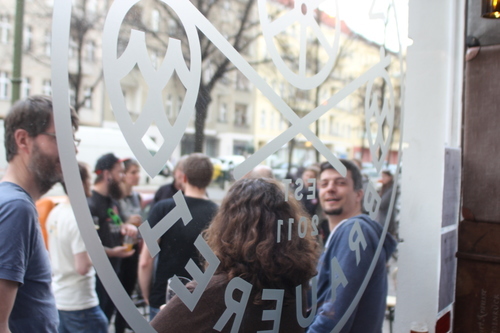 Vagabund Brauerei was born. We believe people today are too disconnected from what they eat and drink. When someone orders a beer in a bar, and no one questions what kind of beer, a part of our soul dies. We know that most people think beer is Pilsner, or don’t care that most of that Pilsner they treasure is owned by a company better known for frozen pizza and baking powder. Unfortunately most people think this way, and a few of them work for banks. We don’t want them to own our brewery and tell us we should brew more mainstream beer to make them more money. Vagabund does something different with the help of like-minded people. We don’t want to just sell you beer, we want to make you part of the brewing process. We want to share our ideas and develop recipes together. We don’t want to tell you how great this beer would go with that food. We want to sit down at the table with you and share it. Buying a yearly membership in the brewery entitles you to two free refills every month in your very own 1l growler. Not only are you getting your beer directly from your local brewery, you get to be part of the dialogue between the brewers and the members. A Vagabund growler which entitles you to two free refills a month. Included in the startup membership is a Vagabund t-shirt and hoody. Membership also entitles you to invites to special recipe designing events and beer tastings. Bonus: With every refill you’ll get a free High Five. Just the 2 liters of beer a month this time; no swag. Free High Fives though. Due to the small size of our brewery we will be limiting membership to 30 individuals. Membership will be based on a first come, first served basis. Email us at info@vagabundbrauerei.com if you're interested. Membership can only be held by an individual and cannot be passed on to someone else. The growler, hoody, and t-shirt only come with your initial start-up membership and are not given out after every renewal. Membership only valid at Antwerpener Straße 3, 13353 Berlin location and not at any future or outdoor Vagabund locations or events. Membership includes 2l of our beer a calendar month. The growler size is 1 liter. Please only request one growler fill on any given day. Vagabund Brauerei not only wants to make beer for people to drink, but we also want to get people involved in the beer making process. That's why we offer brew courses to beginners, who want to have a better handle on how beer is made. The beginner's course is also good for homebrewers who want to have a look at what goes into brewing on a small industrial sized brew system. A course consists of a small group of people in order to make it more personal. We get started at 10:30 and go until 17:00. The course includes coffee, beers, snacks, lunch, and a free glass of the finished beer once the beer is ready to be served. Participation costs €125 (including tax) per person. If interested, please send an email to info@vagabundbrauerei.com. IMPORTANT INFO: Please be aware that it gets very hot in the brewery. Despite this fact, we do ask you to wear pants as well as closed-toe shoes. You should also bring an extra set of clothes with you to change into after the brew day, just in case your work clothes get dirty or wet. That's what we do when we brew, and that's what you should do too. Thanks! 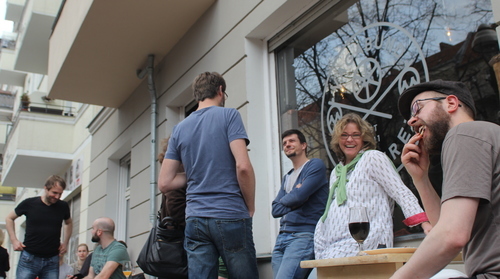 Alternatively, you can also send an email to info@vagabundbrauerei.com - we’ll get back to you shortly. Do you have a party to go to? Do you have friends that can help you drink 10 liters of refreshing, tasty beer? Do you have friends, but none you can trust, and can drink 10 liters of beer by yourself... in secret? Then the party kegs are for you! With the party keg comes the dispensing tap unit (hand pump); you just need to supply a glass to drink out of. If you'd like to order one keg, just send us an email at info@vagabundbrauerei.com and we'll set up the pick-up time with you.